Pig farming is important for agricultural communities in northeast India, particularly in the state of Nagaland, where many rural smallholder farmers rear pigs to supply household meat needs and as sources of income. For years, the International Livestock Research Institute (ILRI) has been working with partners in Nagaland to research on how pig farming can be improved to better support these rural livelihoods, animal health and human nutrition. 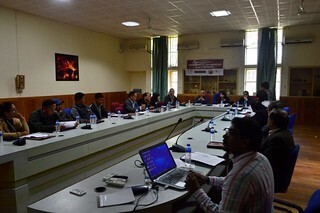 The workshop entitled ‘Towards framing a pig breeding policy for Nagaland’ was held on 15 December 2015 and brought together several scientists and government officials (photo credit: ILRI). Last month (15 December 2015), ILRI researchers and agriculture sector partners in Nagaland discussed the process of ‘framing a pig breeding policy’ in the state at a workshop that reviewed current evidence from ongoing pig farming research. The meeting also generated recommendations for a pig breeding policy in the state, which among other goals, aims to develop pig breeds/cross-breeds that are adaptable, productive and appropriate for the smallholder pig farmers in Nagaland. The need for a breeding policy was motivated by the findings of ILRI studies conducted in Nagaland, which found haphazard breeding within and between various pig breeds due to the absence of a systematic scientific breeding program. One of the studies, which was conducted by Huyen Le Thi Thanh from Vietnam’s National Institute of Animal Sciences and commissioned by ILRI, was presented at the workshop. At the meeting, Arjava Sharma, director of the National Bureau of Animal Genetics Resources (NBAGR), said pigs are an important resource in India whose genetic resource, particularly in Nagaland, should be improved and protected through proper characterization and sustainable utilization. The proposed policy will focus on improved breeds and cross-breeds of Hampshire and ‘Ghungroo’, and Hampshire and ‘Tenyi Vo’, as well as native pigs depending on the needs of specific production systems and locations, whether smallholder, commercial/industrial or urban or rural. A comprehensive technical breeding program that covers nutrition, health care, infrastructure and capacity building. Introduction of fresh exotic germ plasm. Delivery mechanism of germplasm to farmers, including sows/bears and artificial insemination with the support of the government, NGOs, and private sector. Alok Jha, ILRI South Asia regional representative, reaffirmed ILRI’s commitment in supporting the pig sector in Nagaland. V Padmakumar, an ILRI scientist in India, presented pig research in the state made possible through the Tata Trusts–ILRI partnership. Thangi Mannen, commissioner at the Department of Veterinary and Animal Husbandry in Nagaland, said the government would take into consideration the recommendations of the workshop before approving a pig breeding policy for the state. ILRI scientists V Padmakumar and Alok Jha represented the institute at the policy dialogue (photo credit: ILRI). 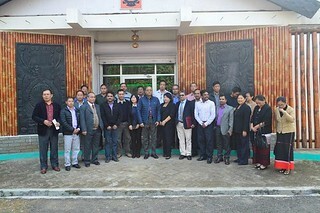 Participants in the workshop included officials and representatives from the North East Development Agency (NEIDA), the National Research Center on Pig (NRCP), Assam Agricultural University (AAU), and other state government and non-governmental organizations working in Nagaland. Read an article in the Morung Express. Read about the importance of pig breeding for communities in Nagaland. Learn more about ILRI-Tata Trusts partnership on Nagaland pig farming. Tags: Animal Health, Breeding policy, ILRI, India, Livelihoods, Livestock, Nagaland, Nutrition, Pigs, South Asia, TATA Trust, workshop. Bookmark the permalink.